I invite you to join me tonight for Doctor Anonymous Show 202 when our guest will be Dr. Kevin Pho who is "Social media's leading physician voice" according to his LinkedIn page. Kevin is author of the KevinMD website. We had a great conversation recently which I will be playing on tonight's show. One topic we'll be talking about will be his upcoming keynote address at the Texas Medical Association meeting this weekend. This keynote address will be broadcast live over ustream begininng at 9:30aET on January 29, 2011 at this link. As some may know, the network that I am a part of, BlogTalkRadio, is going to be going through some changes. And, I have written on this blog before that I am considering a different home for the show. I'll make my announcement tonight about what is going to be happening to The Doctor Anonymous Show. I was asked to be a guest on the Technology Today Podcast on Thursday, January 27, 2011 at 4pm Eastern Time. This show is hosted by Ajay Gupta who is a cyber security expert. And, each month on his show, he highlights the area of Health Information Technology. On the show's blog this week, they wrote the following post called "Is Social Media A Health Care Delivery System?" Social media is a lot of things to a lot of people. Individuals use it to reconnect with old and make new friends. Businesses have certainly begun levering social media as an avenue to reach consumers. Can it really serve as a mechanism for the health care industry to deliver medical care? Join us Thursday at 4pm Eastern on Business.VoiceAmerica.Com as we discuss this and look into how doctors are beginning to engage their own patients and even wider populations on sites such as facebook, twitter, YouTube and through individual blogs. Dr. Michael Sevilla, of DoctorAnonymous fame joins the show to share his insights from over four years of activity in incorporating various forms of social media into his medical practice. You can listen live to the interview at Business.VoiceAmerica.Com at 4pm Eastern Time on Thursday, January 27, 2011 for the Technology Today program. You can join the discussion at 866-472-5790 and by text at 240-731-0756. I also encourage you to check out their facebook page, you can find them on twitter at @TechTodayRadio, or you can e-mail the host at a-gupta@technologytodayradio.com - Hope to see you for the Technology Today show! Thanks so much to the medical student authors of the Future of Family Medicine blog for being guests on Doctor Anonymous Show 201 last week. Not only have they been featured on KevinMD, but they have also been recently featured on the website Opposing Views for their post called "Is Family Medicine A Waste Of Talent For New Doctors?" In the video above, I ask each of the three co-authors about the blog and about their path toward medical school in the first place. 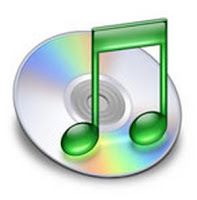 You can listen to the entire audio podcast in the sidebar of this blog. You can also go to the show's iTunes page, download Show 201 and listen anytime. I also encourage you to check out the show's Facebook page and hit the "Like" button at the top. Finally, if you enjoyed this video, I invite you to check out my YouTube page for more. Thanks for stopping by! It's no secret that I wasn't a fan of MDChat 1.0 when it first came on the scene. (Feel free to read my initial review here.) 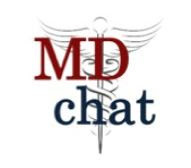 But last night, I saw a tweet out there saying that the Jan 25, 2011 #MDChat would be devoted to Alzheimer's disease including an interview with a couple of people with the diagnosis. This idea intrigued me. I know that this wasn't the first time someone was ever interviewed via twitter. But, I wanted to see with my own eyes how this would play out in real time. Even though I was on call tonight, I caught some bits and pieces of the interview live. And, I also reviewed the twitter stream and transcript. Not only were the stories amazing, but something else I was pleasantly surprised by was that the participants in the "chat" - they didn't chat at all (for the most part) until the Q&A portion of the hour. They respected the instructions and did not cloud up the #MDChat hashtag. So, I know I was harsh on the first go-around. But, this time, I applaud Phil and this innovative edition of #MDChat. Thanks to Gwen & Libby for sharing their stories. And, thanks to the Albert Einstein College of Medicine along with the Alzheimer's Association for their participation in the chat. Well done all around! Just some random announcements to share with everyone. First, I know that I haven't mentioned it in a long time on this blog. But, I invite you to check out this week's Grand Rounds blog carnival over at 33Charts.com. For those who do not know, Grand Rounds is the gathering of the best blog posts for the entire week on one medblog site. There is a great theme on the 33Charts site this week which I will call "Pay It Forward." The theme this week is not the usual self-promotion of your own blog posts. This week, people are encouraged (and required) to plug the blog post of other people. How cool is that? I made a suggestion myself, but I won't share what that is - Hehe. This is going to be a big week in the life of Doctor Anonymous - particularly on Thursday, January 27th. At 4pm Eastern Time, I'm going to be interviewed for the entire hour on the live internet radio show called Technology Today. Of course, the topic will be medicine and social media. 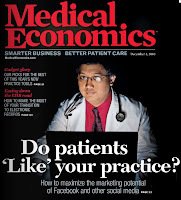 One of the topics we are going to be talking about is my Medical Economics cover/article from last month. You can listen to the live audio stream for the show show live at the VoiceAmerica Business Channel site on Thursday. I invite you to join me for Doctor Anonymous Show 201 where I will be interviewing the authors of the blog called "Future of Family Medicine." I will be joined by medical students who started the blog a few months ago. In the video above, I talk with two of the authors from the blog (You'll have to guess which two they are Hehe). Hope you can join us this week for Doctor Anonymous Show 201 when our guests will be the authors of the blog called "Future of Family Medicine." This unique blog is written by medical students and the topics vary from health policy, to concepts like the Patient Centered Medical Home, and today's post called "The New Deal for Primary Care in Community Health Centers." Join us on Thursday, January 20, 2011 at 9pm Eastern Time on BlogTalkRadio. Also, check out the video promo above. See you for the show! With last weekend's golden globe awards and miss american pagent, not only is it award season for actors and beauty queens, it's also award season for medicine and social media. Last week, I put out this tweet reminiscing about how I miss that the medblog awards were no longer going on - or, at least that what I thought. Just a few minutes later on twitter, I got a message back stating that the awards were just going to be announced. Yesterday, Medgadget announced on their website the 2010 Medblog Awards sponsored by epocrates and lenovo (pretty impressive sponsors). There will be seven categories that will be recognized. The nomination process seems like a quicker timeline, in that nominations close in a few days this coming weekend. 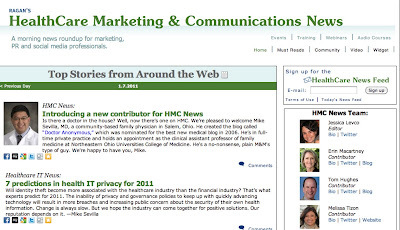 I was lucky enough to be nominated way back in 2006 in the new medblog category. The very popular (and infamous) Dr. Flea blog won that year. The other award that I wanted to share with you is the shorty twitter awards. It's kind of funny because I really pushed to win my category a few years ago during the first year of the award. Another competitor in the same category really came after me and eventually won the category. Also, if you look at this year's site, the category of health is not even what they call a "major" category. Oh well. For most other people writing this type of post, this is where they ask you to nominate them. Me? Well, I'm asking you NOT to nominate me for these awards. Am I still bitter about what happened before? Maybe. But, I know that there are a lot of other better bloggers and "twitterers" out there. I used to really get caught up in this stuff. Not anymore. Jessica Levco from the HealthCare Marketing & Communications Newsletter interviewed me a few months ago at the Swedish Medical Center Health Care Symposium in Seattle, Washington. Of course, we talked about medicine and social media. In the video above, we chatted about why I think physicians need to be online, and at least be familiar with health information resources. I also encourage you to check out today's edition of HMCNews where I profile a couple of interesting stories. Addendum: Apologies if this is not working. I got some feedback on that. Maybe better access the video through their direct link here. Thanks so much to Dr. Jennifer Dyer for being on Doctor Anonymous Show 200 last night. She is a pediatric endocrinologist at Children's Hospital in Columbus, Ohio. She is the first physician in her family and actually started out wanting to be a journalist. But, she became inspired to not only go to medical school, but also pursue a career in pediatrics. Pediatric endocrinology has to do with hormones in the body, which means diseases like diabetes in children. Dr. Dyer is known as @EndoGoddess on twitter, and she is right in the middle of the fight against childhood obesity. She has been making the rounds on the medical lecture circuit talking about how she utilized text messaging to take care of patients. She talks about it more in the video above which is a presentation at a TEDx conference in Columbus, Ohio. You can listen to the entire show in the sidebar of this blog. Or, if you like you can go to the show's iTunes page, download the show, and listen anytime. I also encourage you to check out the show's Facebook page and to press the huge "Like" button at the top. I have also done local TV interviews on health topics. Check out my YouTube page to check those out. Have a great weekend everybody! Dr. A Show 200 Tonight! I invite you to join me for Doctor Anonymous Show 200 tonight! Can you believe it's been 200 shows already? My guest will be Dr. Jennifer Dyer from Children's Hospital in Columbus, Ohio. She is a pediatric endocrinologist and is in the midst of writing up a research paper on how she utilized text messaging to communicate with patients. We'll also talk about her thoughts about medicine and social media in general. There have been a few stated excuses why physicians are hesitant to utilize social media services for things like peer to peer communication and for discussion of clinical cases. The statements that are made are they physicians are concerned about issues of security and privacy. Don't get me wrong, I completely agree with these statements. It's just that organizations, especially physician membership organizations, have been trying to come up with the answer of how to build a site by which physicians can feel "safe" to discuss these type of issues. My professional organization, the American Academy of Family Physicians, announced on their Facebook page yesterday that they are introducing a platform on their website that is "safe" and "secure" to encourage family physician members increased communication. The name of this service is "AAFP Connection," and I give a brief review of this service in the video above. Visually, the interface is nice. There is no doubt that one of the things that they wanted to do is to make the user interface fairly easy to navigate. AAFP Connection has the equivalent of twitter/facebook updates and the ability to store photos. Something interesting is the ability to upload documents and share these as well. I wonder how much this feature will be utilized by users. Of course, the big question is this: Will AAFP members use this platform? My initial gut feeling is no. I have been a member of the AAFP for a number of years now, and the in the "communication generation" before this one, there was promotion of the use of e-mail listservs. What happened there was it was popular for a number of months, and then people didn't utilize as much. For me, there wasn't too much real dialogue, and a lot of people used it for their own self-promotion - thereby giving it a "spam" like feel. In his first day on the job, newly sworn in Ohio Attorney General (and former US Senator from Ohio) Mike Dewine stated his intent to join the lawsuit filed by other states with regard to last year's health care overhaul legislation. He is fulfilling a campaign promise that is outlined in the video above. The core of the lawsuit states that the federal government does not have the authority to require Americans to purchase health insurance. Last year's health care debate was so confusing, I don't know if anyone really knows what is all in there. But in some discussions recently with physicians, they are encouraging the health care repeal legislation to go through "so we can get rid of all this nonsense electronic medical records." Now, I don't entirely disagree with this statement. However, from what I understand, the electronic medical records legislation passed the House days following the president's inauguration in January 2009 and was signed into law a month later. This was the American Recovery and Reinvestment Act (ARRA) of 2009 and it's HiTech Act. So, correct me if I'm wrong. But, the path toward an electronic health record is still there and not going to be a part of this health care repeal legislation. Now, I don't disagree with EMR implementation. But, in taking steps to try to integrate them into practice, it has been difficult, and I think the time lines that have been set out by ARRA are too aggressive and will lead to mistakes that will be blamed on the health care system (meaning I'll be blamed for it), and not blamed on this bad piece of legislation. One of the things that I have always wanted to do is to highlight docs doing interesting stuff away from the job. Recently, I was in our local emergency room (the people "in the biz" and the cool kids call it the emergency department), talking to one of the docs. He is a veteran of the war in Iraq and wrote a short story with an interesting premise. It's pretty obvious that the United States is pretty dependent on energy like electricity. What would happen if terrorists attacked the energy grid of this country? What would be the impact of such an action? How easy would it be to do? Well, this doc has written a fictional story about how possibly this could be done. The story is entitled "1111" which means the date of January 1, 2011. The story begins on the day before. It's definitely an interesting read (read below or click here). In the video above, there is an interview with the doc on our local terrestrial radio station. It's really interesting listening him tell the "story behind the story." This story will make you think. Enjoy! The tragic events in Tucson, Arizona over the weekend has sparked another debate involving gun control, mental illness, and "how can this be allowed to happen again?" The latest information from over the weekend states that they believe that it is a lone gunman who killed 6 people and wounded 14 others during a meet-and-greet session with the local US congresswoman. In a statement issued Saturday night, Pima Community College said Loughner was suspended after a series of run-ins with campus police between February and September, capped by the discovery of a YouTube video in which he accused the college of operating unconstitutionally. Loughner quit school after the suspension, the college said -- and it warned him that to return, he had to present a doctor's note stating that his presence would not be "a danger to himself or others." Man, this sounds really familiar, doesn't it? All too familiar. In the wake of the Virginia Tech shootings back in 2007 (has it already been almost four years since that happened? ), I wrote a series of posts outlining my opinion about mental illness, gun control, and the lack of society's responsibility to finally fix the problem. You may have seen today's report from CNN.com entitled "Doctor Defends Retracted Autism Study." The physician states that he received money not only from the British Medical Journal, but also the Sunday Times of London - where he has been employed since the early 1980s. This physician was stripped of his medical license in May. This first week of January is full of news reports of giving advice on your new diet and exercise program to help you lose that weight that you have always wanted. In a previous post and video, I talk about some "Dos and Dont's" when planning for your New Year's Resolution. In the video above, I talk about some medical issues to keep in mind before starting your program. For example, is there a family history of medical problems like high blood pressure or diabetes? Well then, you may want to schedule an appointment with your personal physician before jumping on the bandwagon. If you find the above video helpful, I invite you to check out other of my TV interviews at MikeSevilla.TV. Enjoy!